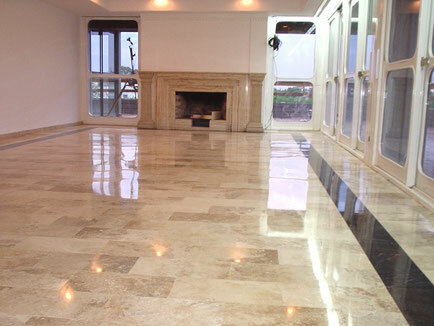 I would like to help you so that you know on the hard floor finishes mostly used in this part of the country, such as natural stones and ceramics tiles. Pavements for floors are usually classified into three major groups: hard, medium and soft. Cleaning procedures vary according to their characteristics. In this article we will analyse hard floors finishes. Artificial stones: terrazzo, tiles, porcelain, mosaic, ceramic tiles. Clay polished: ceramic and glazed stoneware, glazed tiles, etc. Cement: polishing, burnishing, washed or shielded. Although marble is an abundant material in Spain, there are a variety of qualities mostly linked to its hardness so one has to be careful in the selection of this material because a shining sample doesn't necessarily means a good quality marble, it could be that it has been treated with a wax finish, but the material itself is soft and crumbly, only seen after a few weeks of supporting a normal walking traffic. One other aspect that many people may not be aware of is that marble is not very resistant to contact with fat and abrasive products, while slate and granite are waterproof. 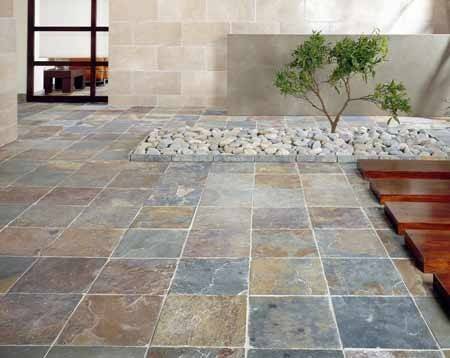 Natural stone are used for exterior walls, facades or floors. In general, it is a very tough finish that endures the passage of time and the aggressive action of external agents. To succeed with the election, it is advisable to know beforehand the characteristics that distinguish each type of stone. The most common are marble, little resistant to contact with fat and abrasive, there are some limestone such as "Crema Marfil" often mistaken as a marble when really it is a limestone although it has properties very similar to marble. Marble is a limestone very hard and dense, but with a low resistance to acids, fats and abrasives products that easily may damage its surface. Their appearance varies depending on the diversity of substances and impurities that make it up. There are white, black, green, red, etc. To differentiate them, it is common for industry to highlight the colour and place of origin of the stone such as white Carrara or green Alps coatings are some of them. Travertine and the comblachien and the very popular Crema Marfil are limestone. Its appearance is very similar to the marble, but its properties are different. The first is a compact limestone. The most common colours of travertine are dark beige and reddish brown. It is used both inside and outside buildings. Its uses and qualities are comparable to the marble, but the decorative effect that is achieved is less bright. On the other hand, the comblachien, in grey with pink areolas, more resistant than ordinary marble but when polished, it becomes very slippery, especially when wet. Sandstone is a sedimentary rock grey or pale beige colour which is composed mostly of silicon sand. Mostly used in indoor applications, in slab format, while the outdoor is used in large blocks of rock to mark traffic areas or walkways. It is a less slippery stones, its appearance remains almost matt although it is polished, now days wax is used to finally bring up a shiny finish. Slate is one of the most traditional natural stone finishes. It has a very fine grain mostly used on north Spain; it is a bluish black, rock although there are varieties in other colours such as green and red. The majority are used for covering floors and roofs. Inside of homes, it is common to find it on the floors and walls of bathrooms and kitchens. Slate, the most common finishes are natural and polished, are very wear-resistant and shows a high waterproof capacity thanks to its low porosity when it comes into contact with water and other liquids that may it cause to stains. However, its main fault is that it may be scratched easily. Slate and granite share the same characteristics, but the latter has a different range of colours. It is possible to find it in gray, pink, red or black. Are made up of hard materials, they are very resistant to shock and wear, and are therefore very durable. They support very well moisture and cleaning products, so it has a low maintenance cost. In general they are homogeneous and have low porosity, although some types can acquire porosity over time and require special polishing treatment. There is a wide range of prices. They are cold and hard to tread and needing to be polished sooner or later to recover its initial splendour.